Hello everyone its good to be back blogging on things I love about and things that fascinates me.Sometimes you love to keep doing what you love doing most and at the other hand you have to make compromises for other things in order to balance your work systems. In the past few weeks I have fully engaged myself in so many activities and that had reduced my consistence in blogging although I missed most of my co-bloggers write-up,but I subscribed to some of them on email so I still get their writes-up through mail. Today I want to talk about 6 gadgets I really missed seeing when I was growing up in my country but had changed due to advanced technology. Those days who cares about having a big size plasma television?,as long as you can see images through the screen wheather colored or not,it then serves its purpose and then its was only the rich ones that you find this in their homes. 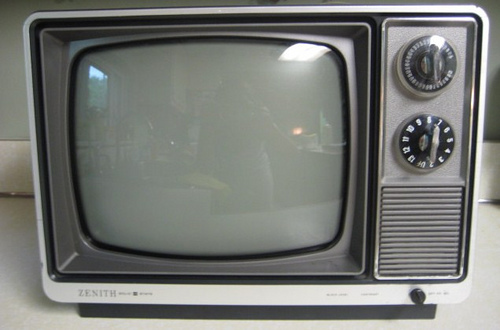 Although Black and white television is still the No1 choice for more than 13,000 homes in the UK. For families who could not afford to buy a black and white television could at least buy a big or small radio to meet up on level with the society,but now who cares about having an old radio at home?everything is modernized! I fully remembered my father banning me from ever touching his record player,it was only used on special occasions and I could remember listening to music only on special periods like Christmas,New year, Easter and sometimes when my dad was in a happy mood!but just only for 30 mins. Although I still find this in some homes but not as it was in those days before the inventions of CD players. You only find this in educated rich people’s home.I remember my dad buying one and placing in our sitting room,but it never rang for one day,I guess he was also saving the ringing for a special moment. Then no office is complete without a typewriter but now no office is complete without a computer. Not that I don’t like the advancement in technologies but I just missed seeing things that existed while growing up.